In the year 1170 AD "Mad-Dog" Madog Ap Owain, Prince of Gwynedd, disappears from the historical records. For centuries there has been speculation across Wales and the wider, non-Welsh-speaking world as to what could have become of this handsome, popular prince who had been surely destined for greatness. The last written record of Prince Madog is contained in "Hanes y Brenin", (History of the King) a four volume history of the kings of Gwynedd written by the monks of Caldey Abbey at the express command of King Dafydd, successor to Madog's father, King Owain. Madog's loss was only the last act in a series of tragedies in the life of his father. In 1163, following ancient Celtic tradition, King Owain announced that he intended to split his kingdom equally between all seventeen of his sons. Almost immediately thereafter Owain's health began to decline rapidly. Alarmed by his father's loss of vitality, his eldest son (Prince Dafydd) took personal control of Owain's well-being and moved him into the highest tower of his new castle at Dolwyddelan. Here Dafydd attempted to protect his father from all possible sources of infection: visitors, food, water, air etc. But nothing, it seemed, could stop the curse that had fallen over the house of Gwynedd. In 1164, Owain lost two sons whilst they led the Welsh cavalry against the English at the battle of Rhostyllen. Here Princes Rhun and Maelgwn both appear to have received arrow wounds to the back as they charged the Saxon hordes. Sadly even their valour could not force the English to take back the town of Wrexham which remained in Wales for another 300 years before briefly being foisted on Cheshire under the resurgent Prince Llewelyn Ap Gruffydd. The following year Princes Iefan and Cynan both died leading men across the Conwy river in separate incidents, apparently attacked by crocodiles and piranha respectively. In 1166 Prince Hywel succumbed to Dutch Elm Disease, while Prince Iorwerth was attacked and killed by a Bigfoot near Caersws and Prince Cadell "evaporated". By 1167 both Princes Cynwrig and Einion had been lost to alien abduction near Cader Idris, and Iago, Ffilip, Rotpert and Idwal all succumbed to Polonium poisoning at the same Caernarfon ale-house between 1168 and 1169. Madog and his brother Rhirid are both said to have left the country in search of new lands shortly after. For those without comedic tastes, the self-proclaimed experts at Wikipedia think they have an article about Prince Madog. In chapter four of "Hanes y Brenin" an unknown scribe takes great pains to dismiss stories of Madog's death, ascribing eye-witness accounts of his beheading at Beddgelert in 1169 as "the slanderous lies of those with evil intent towards our just lord Dafydd". In chapter six he reurns to the theme, warning "Only our Saxon foes profit from malevolent rumour and there is none among us who couldst swear that the quartered body displayed in Rhuthun, Dolgellau, Aberystwyth and Criccieth was Madog's. For 'tis sure that many men have similar scars to Prince Madog's and, verily, some of these must also have the names of Madog's mother, Queen Sioned, his wife and eight children tattooed upon their limbs." "Hanes y Brenin" confirms that Madog's brothers Dafydd and Rhodri jointly inherited the kingdom in 1171 when their father " drowned peacefully in his bed at Dolwyddelan Castle". Twentieth century historians have suggested that both Madog and his younger brother, Rhirid, were executed for political reasons. However, there is evidence to suggest that Madog survived and fled across the oceans. Since Prince Rhodri became the first recorded victim of spontaneous human combustion (1172) and Prince Dafydd's line was wiped out during the English invasions of the fourteenth century, it is possible that the rightful Prince of Wales may be living in North America. 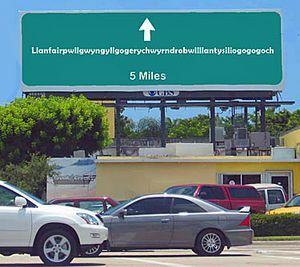 A modern Alabama roadsign bears witness to lasting Welsh impact on the region. "Hanes y Brenin" claims that Madog and his brother sailed from Llandrillo-yn-Rhos in two ships, the Bownti and the Tai-Taneg, both scaled-up versions of the traditional Welsh water-craft - the coracle. They sailed west but found ocean-going unexpectedly difficult, the circular nature of coracles making accurate navigation almost impossible. After six weeks in which they had sailed in three enormous circles only twenty five miles off the coast of the Lleyn peninsula, the expedition suffered a grievous set-back when the crew of the Bownti mutinied. Welsh legend ascribes this treacherous act to the tyranny of their Captain, Gwilym Blau. Blau's insistence that the crew should desist from close-harmony singing long enough to trim the sails and bail out the bilge caused the adventurers to cast him adrift while they absconded with the beautiful brides they had picked up in the exotic and previously undiscovered island they now named Ireland. Madog and his crew continued, blown thousands of miles west by Atlantic storms. Eventually, the surviving party were attracted into the Bay of Mexico by the fragrant odour of petroleum and landed at Mobile Bay. Here they made friends with the local tribes but found the humid climate made it difficult to exchange their heavy woollen trade-goods for much needed local produce. However, the resourceful Welsh quickly found that they could barter for supplies merely by threatening the indigenous people with violence. The phrase "Tŷ hardd. Talwch!" (meaning to drive a hard bargain) is a well-known phrase in the local language despite containing no identifiable Muskhogean words. Interestingly, scholars of semantics have identified this as a much corrupted form of the Welsh phrase "That's a nice Tepee you have there. It would be a shame if anything should happen to it". Having safely established a colony, Prince Madog then returned to Wales with great tales of his adventures. He also landed a large stock of dried herbs he called "Twbago" which he persuaded the population of Anglesey they would enjoy. Buoyed by his success, Madog set out to recruit others for the return to America in the hope of starting a plantation to grow a wondrous root vegetable indigenous to the Americas and called by Indians "Pwy-Tatws". These, he claimed, gave a much smoother smoking experience and could be deep fried in oil to more pleasant effect than the Twbago. A new set of colonists sailed from Lundy Island in 1171 and were never heard of again, leaving behind only legends and emphysema. Early explorers of what is now the deep south reported Cherokee legends of a white tribe who had constructed a stone fort they found near the DeSoto Falls area. This fort was said to be several hundreds of years old, making its construction pre-Columbus. More tellingly, investigations showed the fort had several uncanny similarities to Dolwyddelan Castle in that both structures were built on hills, both were made of rock, and that the rocks had been deliberately placed one on top of another to make walls which joined up to make a defensive barrier. The connection could hardly be clearer. The Cherokee told settlers that the white tribe had suffered grievously from the violent assaults of the Sioux, their defensive tactic of forming a scrum and trying to push their adversaries from the field of battle having repeatedly failed. Eventually, they moved Northeast to try to avoid destruction. Having lost contact with them, the Cherokee could not say what had become of the survivors. In 1799 Sevier reported the discovery of six skeletons encased in brass armour bearing dragons on their chest pieces and shields. The skeletons, he claimed, had been carefully buried in a stone tomb and were miraculously well preserved, as were the thousands of dried daffodils found alongside them. Sadly, details of this discovery disappeared at around the time Sevier was committed in the "Tennessee Hospital for the Mentally Infirm", though note-books in his hand survive telling of his discovery of the Tooth Fairy in Chattanooga and a recipe “for the making of a most wholesome broth from ye Easter Bunny”. Carhenge (Nebraska), The Modoc Pear Company (Oregon), and the gathering of the bards at the 1956 Kentucky Eisteddfod show widespread traces of Welsh culture across the USA. Mandan squaws prepare for a hen-night, circa 1835. Note the Welsh-influence in both their head gear and demure demeanour. In the nineteenth century George Caitlin, a landscape painter, spent eight years living among the Mandans. He became convinced of their descent from Madog’s expedition, claiming that he had spoken to them in Welsh, had been responded to in kind and that Mandan culture overlapped markedly with that of Wales. "I found their traditional food to be almost inedible and feared for my purse on every occasion that tiredness drove me to seek sleep." He painted numerous accurate depictions of their life and culture noting that: “Mandan maidens be most handsome and are not infrequently fair of hair, and in complexion. No other tribe I encountered resembled the ladies of Swansea so much, for only amongst the Mandans do the womenfolk smoke tobacco without cease, urinate in public without shame and disport themselves naked from the waist up.” Mandan men, he recorded, were "Given to bouts of gloomy introspection" and "Blamed neighbouring, more powerful tribes for all their ills." Latter day scholars generally dispute Caitlin’s claims for the Welsh-speaking nature of the Mandans, pointing out that the virtual destruction of the tribe by smallpox in 1837 makes a direct comparison of the two tongues almost impossible. Surviving examples of shared homonyms are, they claim, entirely explainable by coincidence or imports into Mandan from American English in the intervening centuries. Nevertheless, an analysis of words in common use among surviving Mandan speakers shows considerably more overlap between Mandan and Welsh than between Mandan and English, or even Welsh and English. An indigenous Peruvian woman shows how memories of Celtic culture linger by wearing Welsh national costume and hogging the beer. It is possible that we will never know for sure whether the Mandans represented the last vestiges of pre-Columbian Welsh settlement of the Americas. The tale of their arrival in Mobile Bay following a voyage of thousands of miles in a small open boat and the migration of their kin through the southern states under harassment from the Cherokee and Sioux seems fanciful to some. But one might do well to consider the accomplishments of other notable Welsh explorers such as Bwzz Alldryn (first Welshman on the Moon) and H. M. Stanley who traversed the uncharted territories of Africa accompanied by a mere five hundred native bearers and twenty like-minded adventurers armed only with dynamite and Maxim guns. In yet earlier times the world marvelled at the tales of Denbigh-born Marc Ap Iolo (Marco Polo to his Venetian employers) who travelled from Europe to the court of the Chinese Emperor armed with nothing but his native wits and a hundredweight of pickled leeks. Here Ap Iolo introduced the celestial kingdom to the Welsh dragon still celebrated across China every New Year. 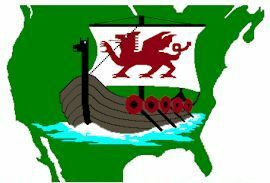 With the spirited blood of Prince Madog in their veins it is highly likely that the surviving Welsh-Americans would have spread out from their southern homeland to explore other parts of the still uncharted New World. Surely the impact of their advanced technology and unusual appearance would have made waves wherever they ventured. Interestingly, when Hernán Cortés set out to conquer the Aztec Empire for the glory of Spain he was greatly aided by myths of their great white god, Quetzacoatl - said to be able to "sing for hours without pause for breath or recourse to any form of harmony". Similarly, Pizarro's invasion of the Incan empire might easily have been stopped in its tracks in the narrow Andean passes had not the local people been in awe of the return of their own white God, Viracocha. It is said that Pizarro's enormous stomach, hatred of the English and unceasing need to talk about himself convinced the Incas that he was indeed Welsh. Early Spanish chronicles also suggest that the Incan national animal (the Llama) was named by Viracocha in the language of heaven a "tongue incomprehensible to all and said to drive to insanity those who attempt to master it." To this day every newly excavated Mayan city is found to possess a ceremonial sports-court wherein, according to archaeologist Hiram Bingham, "young men, frequently intoxicated on ceremonial beer, risked everything in pursuit of a small ball to little or no end. As far as can be told from this distance in history there seem to have been few rules to this game, with eye-gouging and garrotting common place and highly appreciated by the crowd." Could there be a better description of that most traditional of Welsh pursuits - Rugby Union? Even as far away as lonely, windswept Patagonia we find colonies of penguin a bird named in ancient Welsh from the words "Pen" meaning "Head" and "Gwyn" meaning "White" - a last attempt at irony perhaps from the dying, distant descendents of Madog as they encountered this resolutely black-headed bird at the very end of their new continent.